Happy Bloggers Challenge Friday! Thanks to those who played along with the Girlfriends Challenge, the challenge this week is By the Sea. I don't know about you, but I'm looking forward to warmer days and flip flops! Inspired by the Mojo Monday Sketch Challenge, I created my card using stamps and dies from Our Daily Bread Designs along with Bo Bunny pattern paper. I stamped the Hammock image from the Happy Retirement stamp set in Black Archival on Ivory Confetti card stock, then added color using STAEDTLER Egro Soft Watercolor Pencils, blending the colors with Gamsol. I die cut the stamped panel using the Circle Ornament Dies, then layered on a Black panel that was die cut using the Matting Circles Dies. 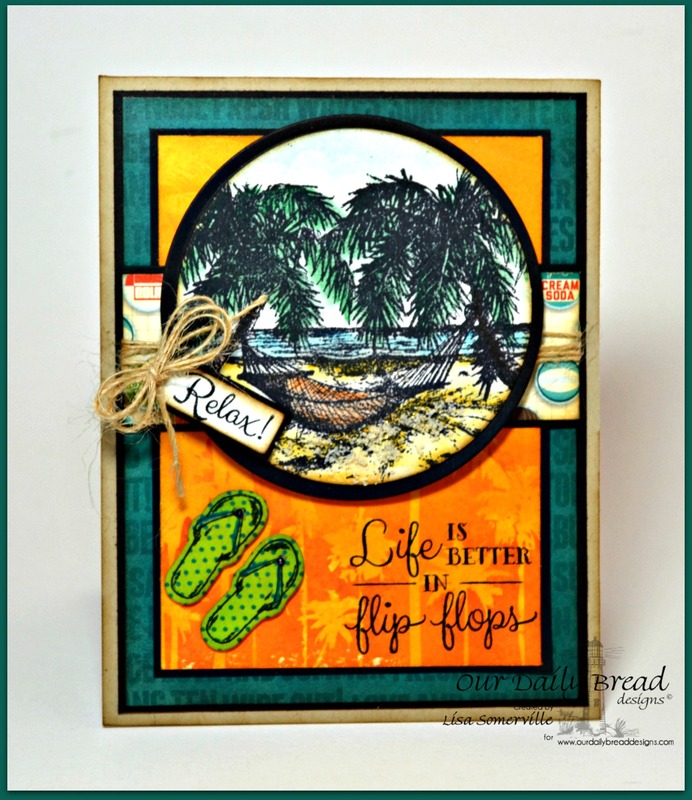 The flip flops and "relax" are from Flip Flop Fun, and the sentiment is from Life is Better. I stamped the word in Black Archival on a scrap of the Ivory Confetti card stock that was cut using the Mini Tags Dies, layered it on a Black panel then adhered it to the card with dimensionals. The flip flops are stamped in Black Archival on scraps of the Bo Bunny pattern paper, then die cut using the Flip Flops Dies. I used a SAMJ to add the sentiment as shown. To further embellish I added Twine, gems to the flip flops and a bit Mudd Puddles sand to the area under the Hammock. If you would like to play along with this weeks Bloggers Challenge, please link back to this post on your blog and mention you created your card for the Bloggers Challenge By the Sea Challenge. Please add your link using the Link Tool below, your link should be a direct link to your Bloggers Challenge Post, use your name as the Title. Please do not link to cards that were created prior to the challenge date. Entries not linking properly, or backlinked will be removed. If you have the captcha enabled on your blog, please consider turning it off, as it makes it so much easier to leave comments. I can attest to that! This is such a PARADISE card, beautiful work. Oh how I wish I were lounging in that scene right now! That scene looks fabulous, Lisa! How fabulous! Love those flipflops. Thanks for playing along with Mojo Monday!